Even before the season starts, we inevitably begin to wonder how the season will end. Who will win? How do the teams stack up? Will one team dominate? Let’s take a look. The 2014 Champion Diego Rollers, captained this season by Hellphaba and co-captain Hit N Run, have a hard-hitting team. With veterans Kung Pow Tina, Ryder Hard and returning favorite Boo La La, the Diego Rollers have a trio of triple threats ready to take on any roll. 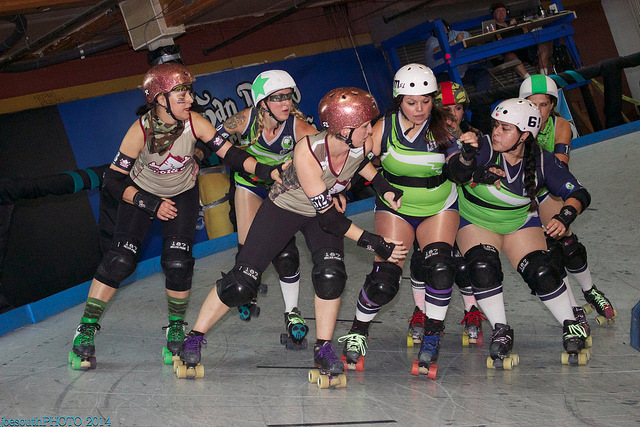 Rookies Fire ‘N Spice and Kelly Clocksem will have their official roller derby debut on the 22nd. And Hedy LaScar had a strong debut performance on the Sparks earlier this year. This mix of dominant veterans and newer skaters may depend on the chemistry they have on the track. Hard Corps, undefeated during the 2014 season, is the only team to return with all original players. Led by captain Tsunami and co-captain Selenium, Hard Corps returns with jammers Hartlyn! and Vermilion Valkyr. Blockers Amor Apache, Hard Kase, Killer Groove, Olive RockNRoll and Setty Machette round out the lineup. Without a strong jammer rotation, this team will depend on their tough defense and pre-existing team chemistry on the track. The Swarm will be looking for a comeback this season, having come in third place last year. Captained by Zombie Dearest and co-captain Dirty Verde, the team has returning triple-threats and fan favorites Slamurai and Brazen Bull. Rounding out the team are returning skaters Kupcake Kaboom and Mayhem and transfer skaters Lilly Slaughter and Reck’em Ralph. The Swarm appears to have the most well-rounded and experienced team, but we’ll have to wait for the season to start to see how they compare. Decide for yourself. Come watch the home season opener this Saturday, August 22nd! More event details below.